The Poole WwTW site was initially selected to test the ProAm ammonia monitor on final effluent, over a two month test period in 2004. The trial was a success and Wessex Water decided to make the installation permanent. Since making the initial installation at the UV disinfection plant, four additional ProAm monitors have been installed across the site. Instruments are now permanently installed to continuously monitor pre and post BAFF treatment, eastern works effluent, western works effluent and on the combined final effluent. Final effluent monitoring installations have also been made at many other sites such as Dorchester, Holdenhurst, Hurdcott, Petersfinger, Pewsey, Shaftsbury and Warminster to monitor final effluent. Wessex Water applications also include monitoring the CSO (Combined Sewer Outfall) and settled sewage, to provide forward control. Typically the installation comprises a fast sample loop with a panel filtration system maintained with compressed air cleaning. However, the instrument has also been configured to draw a sample directly from the effluent chamber. The instrument has been selected as it is a robust technology which is unaffected by the physical nature of the sample and it self validates its measurement, by performing a two-point automatic calibration. Wessex Water have selected the ProAm as their preferred final effluent ammonia monitor and awarded PPM a framework supply. 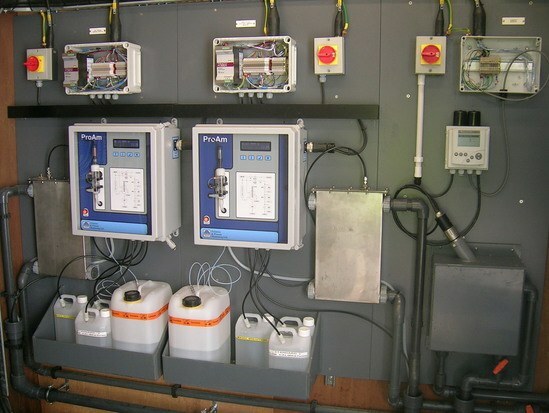 Since making the initial installation, the ProAm technology is now used at over 30 sites within Wessex Water to provide continuous final effluent quality measurement. Operators have reported that they find the instrument simple to operate and maintain. Additionally, the instrumentation selection was influenced by the quality of support PPM has offered over an extended period of operation since completing the first installation in 2004. The instrument has also been selected for use by other major UK water companies for final effluent monitoring. Severn Trent Water has conducted lengthy evaluations to identify instrumentation which is simple to maintain and reliable in operation. The ProAm performed extremely well during these product evaluations and PPM has been awarded a supply agreement. The installation programme has made extensive ProAm installations for final effluent monitoring applications at over 250 sites within Severn Trent Water.